Keeping track of all your data can become a cumbersome process, especially when looking at drawing data multiple platforms and tracking different stages of the buying cycle. Pulling reports from multiple sources can quickly become tedious and on top of that inconsistencies arise, requiring deep diving to answer simple questions. In the world of websites, data collection and interpretation is a key differentiator behind good sites and great sites. Data can be intimidating in my personal experience and many site owners would sooner pass on the responsibilities to others or ignore it completely. But, it doesn't have to do be seen as such a painful task, if the collection is automated, stored correctly and maintained consistently it can be a dream. I've seen one traffic analyst be more effective and insightful than an entire BI team. Data is all the same to everyone until you get someone who can make sense of it. While there is nothing wrong with using multiple tracking tools. I would always recommend using one platform for the majority of your data and reporting needs, it just makes life easier. You can pull quick stats, make faster decisions and stay ahead of trends and more importantly your competitors. So in the interest of the one tool rule, I've decided to tackle data importing into GA one topic at a time. One of the most painful and important transactions to keep track of, which many ignore is refund data. If your an eCommerce store, you will have to process a refund sooner or later. While GA is a great tracking and analytics tool it cannot capture every single action on your site, especially post-purchase actions and off-site actions but it doesn't mean it can't be done. If you don't process many refunds partial and you it's more of an ad-hoc request, then we recommend this the singular form submission refund data method. Click on the admin panel of the view you're wanting to use, under the view column select eCommerce settings. Make sure enhanced eCommerce tracking is on and click submit. Thanks to Julian at measure school who created this nifty Google form that can be synced to you GA very easily. If you have to process a number of refunds partial and full refunds within a week, then we recommend this bulk uploading of refund data method. Refund Data Import relies on the Transaction ID (ga:transactionId) to reverse E-commerce hits in your data. You can refund the full amount of the transaction or issue partial refunds. To issue a full refund, you only need to upload ga:transactionId. The entire transaction, including all products, will be refunded using the originally reported product quantities, prices, and transaction revenue. 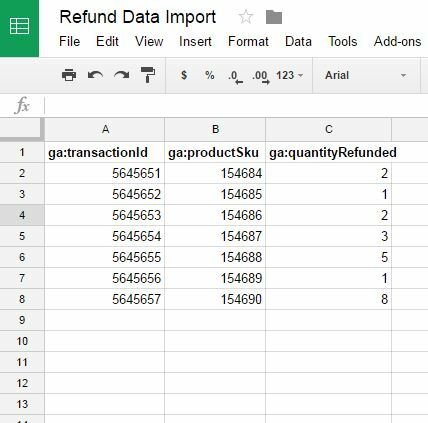 To issue a partial refund, in addition to the transaction id you need the ga:productSku and ga:quantityRefunded using a new row for each SKU being returned. Refunded transaction revenue will be determined automatically based on the product price and quantity. So in your Google Spreadsheet, the first header should use the internal dimension names (e.g., ga:transactionId instead of Transaction). and ga: quantityRefunded which are also required for partial refunds. A small window will pop up asking you to authorise permission to access your Google drive and Google Analytics. Once you do so, the data will get uploaded successfully to Google analytics as long as it’s in the correct format:- Now, you can schedule an upload to happen on an hourly, daily or weekly basis, Google will run the script and import the data exists your spreadsheet through their management API. On the other side, you should also agree with the team who is in charge of processing refunds to fill out this spreadsheet once a refund happens. Once you’ve uploaded refund data, you can see it in the Sales Performance report. Please note that You cannot delete or modify refund data once it has been uploaded to your Analytics account. You bear sole responsibility for validating the accuracy of your refund data prior to sending it or uploading it to Analytics. There you have it, two great ways to manage and track your refunds without any help from your software developer.